– Located less than 2 miles from Chichén Itzá. 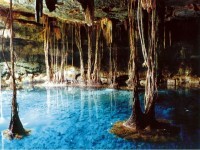 Called the “Sacred Blue Cenote,” it is a perfectly round well-type cenote with magnificent hanging vines and waterfalls. This is an ideal place for cooling off after visiting the ruins! The open cenote sits about 85 feet from the surface, and a grand stairway leads you down the steps into the water. The town of Cuzamá is known for the large number of cenotes found there. Here you can take a tour that will visit three cenotes. The main cenotes are: Chelentun “laying down rock,” Chansinic’che “tree with small ants” and Bolonchoojol “nine drops of water.” The Chelentun Cenote has incredibly blue and clear water, with excellent visibility. Stalactite and stalagmite formations add to its unique beauty. Zaci – In the center of Valladolid is a popular cenote for swimming in the refreshing waters. It is also home to a rare species of eyeless black fish known as a “lub.” A third of the cenote is covered with stalactites and stalagmites, and there is a walkway around the entire cenote. – This village gets its name from the large number of cenotes located within the town and on the outskirts – more than 150 according to the locals. It is easy to locate a guide to take you to some of them – just ask. – At the Mayan site of Dzibichaltún is the closest cenote to Mérida. Meaning “old village,” it is an open ground level cenote, great for swimming. It is more than 140 feet deep at one end and offers yet another great place to cool off after climbing pyramids! Dzitnup or Keken – About 4 miles southeast of Valladolid, this cenote is underground with a hole in the ceiling. It is probably one of the most photographed cenotes in the Yucatán. The waters are deep and crystal clear. There is lighting and a guide rope to help you on your way to the waters. Kankirixche Cenote “tree with yellow fruit,” – Here is a large, spectacular sub-aquatic cavern with crystal clear water that allows fantastic visibility for snorkeling or scuba. You will also find stalactites and tree roots in impressive formations from the ceiling to the water. A tour is required to see this cenote. Contact Mayan Ecotours. Among the New Seven Wonders of the World, announced on July 7, 2007, in Lisbon, Portugal is the Kukulkan Pyramid, also known as “El Castillo” (the castle), the tallest restored structure in the Chichen Itza ruins. A total of 18 structures have been restored. At the top, El Castillo allows a view of all Chichen Itza. The Chichen Itza site is the second most visited Mayan site, after Teotihuacan, on the peninsula. During the spring and autumnal equinoxes (March and September), the setting sun creates shadows on Kukulkan that look like a snake slithering down its steps. This is a popular event that draws big crowds. Dzibilchaltún is a relatively small Maya archaeological site in the state of Yucatán, approximately 10 miles north of the state capital, Mérida. The site is believed to have been occupied for 3,000 years until the arrival of the Spanish, and is known to be the longest functioning city of the Mayan world. It was once a successful port of Mayan trade, and had a peak population of about 20,000, which declined with the rise of Chichen Itza. Dzibilchaltun ruins are for those interested in a significant Mayan ruins and an excellent museum full of Mayan artifacts, textiles, stela, and temples. It also has a deep cenote, excellent for a cool swim after hiking over the ruins. Edzna was occupied very early, from around 600 BC, but didn’t develop into a major city until 200 AD. The buildings that are still in existence are a little older than that. The word Edzna comes for the ‘House of the Itza’ suggesting that the city was influenced by the family Itza long before they founded Chichen Itza. While Edzna is not a large site, it’s main plaza is outstanding and not to be missed. The site can be seen in under an hour. Twenty minutes north of Vallodolid, Ek Balam was built in the mid Pre-Classic period (1800 BC – 250 AD) and has a grand central pyramid, two large palaces, and other temples and buildings. There is much evidence that Ek Balam was an important and influential city. While many cities in the Yucatan had a life span of 500-600 years, Ek Balam was inhabited for 1000 years. And, while this archaeological site is not as restored or as large as Chichen Itza or Uxmal, it is under active restoration which gives a visitor an idea of what the archaeological process entails. Mayapan (“Banner of the Mayas”) is believed to be the last political and cultural Mayan capital, reaching its peak in the Post-classic (1220 – 1600 AD) period. Mayapan is one of the largest Maya archaeological sites on the Yucatan peninsula and is situated 24 miles southeast of the city of Merida. The site is surrounded by many cenotes, and by a fortified wall which enclosed more than 4000 buildings, covering an area of close to 1.5 square miles. Mayapan’s ancient glory remains evident in its buildings. 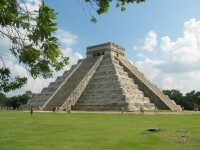 Chichen Itza’s influence is seen in its main building, a smaller replica of El Castillo, the Kukulcan pyramid. Almost 80 kilometers south of Mérida, the capital of the Yucatán state, is the ruin of Uxmal, an influential Mayan metropolis of the late Classic period (600 – 900 AD). In its heyday, Uxmal’s influence spread across the northern Yucatán and included subjugating the settlements of Labná and Sayil. The first structure on site is the astonishing “El Adivino”, or Pyramid of the Magician. It is about 35 meters in height and among the most imposing relics of ancient Mesoamerica. Buried between hills of dry deciduous forests, Uxmal testifies to the ingenuity of the Maya people to, not only survive, but to thrive in a region prone to drought.